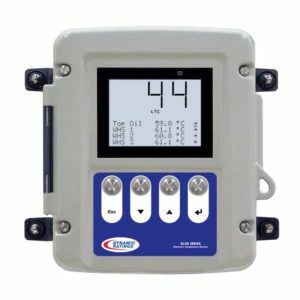 Why make the switch to a B100 Electronic Temperature Monitor? unreadable and the needles often stick, causing inaccurate measurements and preventing proper cooling control. Unlike gauges, the B100 stores the long term history of temperature data and alarm activations in real time or for download later. Easy to read, the LCD display can be seen from up to 60 feet and can be read in bright sunlight or at night. Top Oil plus up to three winding temperatures. Cooling circuit control, alarms, relay trips, LTC differential. Backlit LCD screen visible from 60 feet. Cycles through critical temperature measurements. On-unit configuration with secure access. Uniquely configure and combine alarm and set-point triggers. 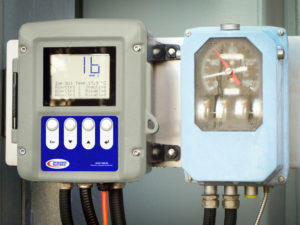 Replaces up to five mechanical gauges (Top Oil, LTC Oil, up the three Winding Hot Spots). Easy to read at night and in bright sunlight, no need to open enclosure. No computer required to change settings. 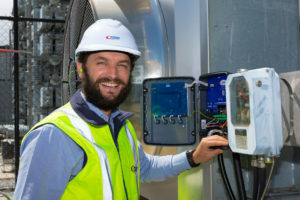 Combination of alarms and setpoints significantly reduce wiring complexity compared to meters. Easy to install for retrofit applications using multiple cable sizes. Rugged, durable enclosure designed for long life and to protect against harsh environments created by water, dirt, dust and temperature extremes.